“The Baby Tooth Survey was initiated by the Greater St. Louis Citizens’ Committee for Nuclear Information in conjunction with Saint Louis University and the Washington University School of Dental Medicine as a means of determining the effects of nuclear fallout in the human anatomy by examining the levels of radioactive material absorbed into the deciduous teeth of children. Founded by the husband and wife team of physicians Eric and Louise Reiss, along with other scientists such as Barry Commoner, the research focused on detecting the presence of strontium-90, a cancer-causing radioactive isotope created by the more than 400 atomic tests conducted above ground that is absorbed from water and dairy products into the bones and teeth given its chemical similarity to calcium. The team sent collection forms to schools in the St. Louis, Missouri area, hoping to gather 50,000 teeth each year. Ultimately, the project collected over 300,000 teeth from children of various ages before the project was ended in 1970. Preliminary results published by the team in the November 24, 1961, edition of the journal Science showed that levels of strontium 90 in children had risen steadily in children born in the 1950s, with those born later showing the most increased levels. The results of a more comprehensive study of the elements found in the teeth collected showed that children born after 1963 had levels of strontium 90 in their baby teeth that was 50 times higher than that found in children born before the advent of large-scale atomic testing. 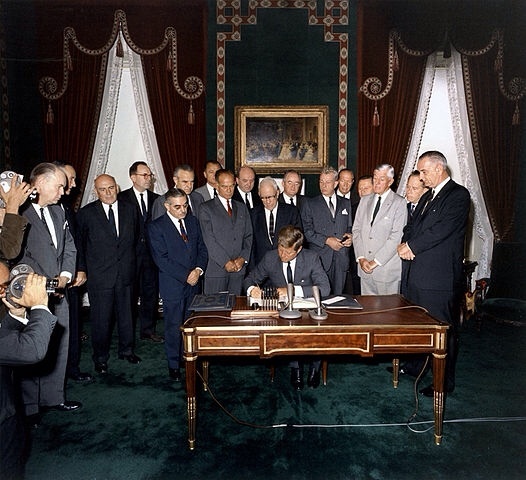 The findings helped convince U.S. President John F. Kennedy to sign the Partial Nuclear Test Ban Treaty with the United Kingdom and Soviet Union, which ended the above-ground nuclear weapons testing that placed the greatest amounts of nuclear fallout into the atmosphere. A set of 85,000 teeth that had been uncovered in storage in 2001 by Washington University were given to the Radiation and Public Health Project. By tracking 3,000 individuals who had participated in the tooth-collection project, the RHPR published results in a 2010 issue of the International Journal of Health Service that showed that the 12 children who later died of cancer before the age of 50 had levels of strontium 90 in their stored baby teeth that was twice the level of those who were still alive at 50. The Baby Tooth Survey inspired a number of similar initiatives in other parts of the world. For example, what became known as the Tooth Fairy Project was developed in South Africa by Dr. Anthony Turton and his team at the Council for Scientific and Industrial Research (CSIR) in order to determine whether human health impacts arising from radioactivity and heavy metal pollution downstream from gold mining activities, driven by acid mine drainage, was occurring. Staff. ‘Teeth to Measure Fall-Out’, The New York Times, March 18, 1969. Sullivan, Walter. ‘BABIES SURVEYED FOR STRONTIUM 90; Ratio to Calcium in Bones Is Discovered to Be Low A survey has shown that pregnant mothers and their unborn children absorb radioactive strontium, as a substitute for calcium, only about 10 per cent of the time’, The New York Times, November 25, 1961. Hevesi, Dennis. ‘Dr. Louise Reiss, Who Helped Ban Atomic Testing, Dies at 90’, The New York Times, January 10, 2011. Wald, Matthew L. ‘Study of Baby Teeth Sees Radiation Effects’, The New York Times, December 13, 2010. ‘Tooth fairy project may reveal effect of uranium – Environment South Africa.’ Environment.co.za (2010-05-22). ‘South Africa Water Crisis – Poisoning the Masses’. Southafricawatercrisis.blogspot.com (2008-11-22). On a warm June day in 2001, Joe Mangano sat in his office, located in his New York City apartment. The day was proceeding normally when the phone rang in the afternoon. It was Danny Kohl, a biology professor at Washington University in St. Louis. Mangano was a researcher with the group Radiation and Public Health Project (RPHP). He had been in touch with Kohl, who had been at Washington University for over 40 years, and had shared his recollections of the old St. Louis tooth project with Mangano. The call was quite unremarkable, in the minds of both Kohl and Mangano. Kohl had gotten word from university officials who contacted him as they looked for storage space. ‘The University has boxes of teeth’ revealed Kohl, ‘at Tyson Valley, a World War II gunnery range near St. Louis, now owned by the school.’ Mangano knew this meant baby teeth left over from the landmark study of radioactive Strontium-90 from atomic bomb tests in bodies. The study led to passage of the treaty that halted bomb tests above the ground, but had ended in 1970. Kohl had first phoned Barry Commoner, a biology professor who had directed the study, to ask if he was interested in the teeth. Commoner replied that he wasn’t, but that Mangano’s group, the Radiation and Public Health Project, should be contacted, since it was conducting another study of baby teeth of children living near nuclear reactors. ‘I don’t really know. I’ll drive out soon to check them out, and maybe I’ll take Rosenthal with me’ (referring to Harold Rosenthal, who ran the laboratory in the 1960s. Rosenthal had retired but still lived in St. Louis). Unlike the day before, Mangano’s eyes widened. This was big, big news, a jackpot. There were thousands, maybe tens of thousands of teeth that hadn’t been used in the old study, quietly slumbering away for over three decades. Washington University wasn’t interested in them, and if there had been no takers, they would have thrown them away. When Kohl asked if RPHP was interested in the teeth, Mangano responded with a ‘my God, yes.’ His mind began to race. The teeth could still be tested for Strontium-90. The tooth donors weren’t children any more, but in their 40s. This could mean an incredible health study, tracking the health of St. Louis kids who had donated teeth, to see if those with high Sr-90 levels as children were more likely to have died or developed cancer by middle age. This kind of health study is known as a prospective, or longitudinal study, considered the gold standard of health research. Humans are identified for risk factors and their health is tracked over time. Probably the most famous prospective study is the Framingham heart disease study. In 1948, federal officials signed up 5,000 residents of the Massachusetts town bearing the study’s name. As time went on, researchers began to see that those with heart disease were more likely to be smokers, overweight, sedentary, and have high-fat diets. These patterns held up over 50 years, for both men and women. Much of what scientists know about heart disease risk today is from the Framingham study. The big problem with prospective studies like Framingham is that they often take many years and require large sums of money. As a result, not many are attempted. But the St. Louis teeth offered a chance for an ‘instant’ prospective study that would be much less costly than others. Tooth donors hadn’t been followed since they gave their teeth, but death records and health histories could provide the same information as if they had been continually tracked. The ability to detect levels of Strontium-90 (or other slow-decaying radioactive chemicals) would allow ‘high-risk’ and ‘low-risk’ children to be identified. And with thousands of teeth, significant samples would not be hard to obtain. Things began to happen quickly. Mangano phoned his colleagues at RPHP, including Jay Gould, Ernest Sternglass, and Bill McDonnell. As the excitement spread within the group, each was sworn to silence: not a word was to be breathed. After all, they were still the property of Washington University. Moreover, nobody knew if the health study was feasible, until it was determined that either death records or health histories of tooth donors were needed. Most boxes were sent to McDonnell, who had the space to store them, but 12 were sent separately to Mangano, just in case the unthinkable happened and the teeth were damaged or lost. They arrived safe and sound, however, and Mangano and McDonnell began to dig through the boxes. The biggest finding was that Kohl’s estimate was very, very low – the actual number was 85,000 or more. McDonnell estimated that about 90% of the teeth were persons born 1954-1963, with 55% born in 1958, 1959, and 1960. Probably 95% or more had cards attached to the teeth with information identifying the donor that was legible, thus making it possible to use the teeth in a research project. The visual effects of old 3 x 5 cards paper-clipped to small manila envelopes were strong, like going back into time. When the 86 year old Gould was hospitalized shortly after the teeth were sent from St. Louis, Mangano paid a visit and brought along some teeth. Gould was in a downcast mood, feeling trapped in his hospital bed. But when Mangano produced several teeth envelopes and cards, Gould’s eyes bulged and his jaw dropped. ‘Oh my’ he said over and over as he handled the teeth, before breaking into a hearty laugh. Mangano and Gould attended a board meeting of Standing for Truth About Radiation, the Long Island anti-nuclear group. Mangano made a brief presentation, and passed around several tooth envelopes and cards for board members to examine. Model Christie Brinkley, a member of the group’s board, immediately saw an opportunity. She began posing with the teeth, in a parody of modeling, as a camera snapped pictures and everyone laughed. Despite all the excitement, RPHP had work to do before making the discovery public. In particular, was it possible to do a health study in which tooth donor’s health history could be followed up? The first question was whether it was possible to find which donors were deceased. The results were positive. The National Center for Health Statistics informed Mangano that it kept records of all deaths in the U.S. beginning in 1979, including the name of the deceased, date of death, and cause of death. All that was needed to locate someone who died was their first and last names (maiden name for women), date of birth, and parent names – each of which was on the cards attached to tooth envelopes. If RPHP wanted to spend less money, the state of Missouri also kept records of all deaths beginning in 1979, for deaths that occurred in Missouri. Deaths alone might make a good follow up study. About 5% of the baby boomers who were young children in the 1960s had died by their late 40s, about 7% of the males and 3% of the females. But a substantial number of these were from causes that had nothing to do with radiation exposure, like accidents, homicide, and suicide. What about those who were still alive but suffering from cancer or other diseases? There were probably as many cancer survivors as there were cancer deaths. To find out which tooth donors were sick, they needed to be contacted at their current address. Before the Internet was invented, it probably would have been impossible to find these people. But now, companies could take a person’s name and birth date and locate their current address. Gould financed a trial in which 100 St. Louis tooth donors were randomly selected and a search firm attempted to find them. The search for girls did not turn out well, probably due to the fact that many had married and changed their name since they had donated a tooth. But there was good success with boys, as a current address was produced for 82% of them. RPHP then mailed a draft survey to these boys, asking if their birth date and parents names were correct, and if they would be willing to participate in a follow up survey. About 35% responded, all indicating the information was correct and that they would be glad to join such a survey. RPHP believed the 35% figure could be boosted; there was nothing on the return address to indicate the letter had to do with the baby teeth survey, so some may have dismissed it as junk mail and thrown it away. In addition, letters were sent while the country was in the midst of a panic after deadly anthrax was sent to Congress through the mail in the wake of the 9/11 terrorist attacks. The final step before going public was to see if Sr-90 could be detected in the teeth. McDonnell sent a sample of teeth to radiochemist Hari Sharma, who had been testing teeth for the RPHP study in his laboratory. McDonnell deliberately did not tell Sharma that these teeth were over 40 years old, only that they were baby teeth. Using the study protocol of testing each tooth for about seven hours to get as accurate a reading as possible, Sharma came up with an accurate Sr-90 measurement for the majority of them. Some readings were inaccurate because of the lack of healthy enamel. There was also the possibility of testing for other radioactive chemicals aside from Sr-90 in the St. Louis baby teeth. One lab advised that Plutonium-239 could be detected, and with a half life of 24,000 years, virtually all of it from the bomb tests would still be in the teeth. This gave RPHP another option for a health study. With all preliminary questions answered, the health study was now feasible. And RPHP decided to let the country know about the discovery of the treasure of teeth. The article went on to describe the opportunity to perform a follow-up health study on tooth donors. It quoted Harold Rosenthal as saying ‘we still don’t know the effect of that on health,’ referring to atomic bomb test fallout. The Post-Dispatch had its scoop, and the story hit the Associated Press wires and spread like wildfire through the U.S. media. All four major St. Louis television stations covered it, as did KMOX and other radio stations in the city. Newspapers from many cities wrote articles, including the Denver Post, Las Vegas Review Journal, Los Angeles Times, Omaha World Herald, Pittsburgh Post-Gazette, Salt Lake City Tribune, San Diego Union Tribune, San Francisco Chronicle, and Washington Post. Gould was interviewed by National Public Radio, and the British Broadcasting Company aired a story. In January, USA Today, with the largest circulation of any daily U.S. newspaper, published a lengthy article. The San Francisco Chronicle even published an editorial supporting the idea of a follow-up health study. ‘After World War II, the United States exploded 100 nuclear bombs above ground, mostly in Nevada. At the time, peace activists – then discredited as Nervous Nellies – worried that strontium-90, a byproduct of nuclear testing, might pollute children’s milk. . . Now workers at Washington University in St. Louis have unearthed those long-forgotten baby teeth. The New York-based Radiation and Public Health Project is attempting to find the adults who once donated them to science. Most, but not all, the publicity was positive. The Washington Post article was headlined ‘Revival of Baby Teeth Study Denounced: Bid to Explore Effects of ’60s Radiation on Donors in Later Years Called ‘Junk Science’. But by and large, most of the coverage was an exciting account of the discovery and prospects for a health study. ‘I was born in 1951 in St. Louis. . . I remember receiving a little button with a gap tooth smiling boy with ‘I gave my tooth to science.’ In 1991 I was diagnosed with squamous cell cancer of the left tonsil. . . I was told I had the tonsils of a 60 year old smoker and I’ve never smoked or drank in my life. I’ve had a suspicion for a long time that this had been more ‘environmental’ in nature. Other letters were from people who did not have cancer, but suspected that bomb fallout may have harmed them. But these critics were overwhelmed by public support for a study of St. Louis baby tooth donors. It seemed almost certain that a follow up study would be funded. Years earlier, Gould had received support for his first book Deadly Deceit from the Deer Creek Foundation, a St. Louis charity that funded liberal causes. RPHP placed an application to Deer Creek, proposing to study a sample of the St. Louis tooth donors. A number of people who were leaders of the study 40 years ago sent in letters of support. These comments were strange, given that Commoner had suggested the teeth be given to RPHP. Moreover, years ago he had argued strenuously for a study evaluating childhood cancer risk from bomb fallout by studying Sr-90 in teeth, only to be told by Harold Rosenthal that such a study was not possible with the lab instruments then available. Nobody at RPHP had any explanation for Commoner’s thoughts. Soon after the phone call, Deer Creek rejected the RPHP proposal. Several other applications followed in St. Louis and elsewhere, but all were rejected. The prevailing reason was that such a study had little relevance – bomb testing above the ground had ended with the 1963 Treaty. But in truth, the issue is a current one still unresolved decades later. About 140 million Americans exposed to bomb fallout are still alive. Virtually all of them have a family member or friend who has suffered from cancer, and many still don’t know the cause. The U.S. government insisted that bomb fallout hadn’t harmed one single American until 1997, when the National Cancer Institute issued a report. (The report had begun 15 years before, and had been completed 5 years earlier, only to sit on the desk of the U.S. Energy Secretary). The massive, 100,000 page study, whose release was forced by Energy Department official Robert Alvarez, made estimates of Iodine-131 exposures from Nevada bomb tests in the 1950s and 1960s for all Americans, according to their place of residence, birth date, gender, and milk drinking habits. The findings were shocking. The doses from iodine-131 were more than 100 times greater than government estimates years earlier. Some counties in Idaho and Montana received hundreds of times more exposure than in less-hard hit areas, such as much of the west coast and desert southwest. The estimate from the report was that between 11,000 and 212,000 Americans developed thyroid cancer just from I-131 exposure from the Nevada tests. The report was a landmark, but it did not cover the dozens of other radioactive chemicals, nor did it examine harm from U.S. tests in the Pacific, and Soviet tests in Siberia. Some hoped that the 1997 study would be a springboard for more analyses – but exactly the opposite happened. The following year, an expert panel at the Institute of Medicine reported that there is no good way to identify just which Americans developed cancer from bomb tests. The panel also sought to soften the 1997 study by stating that the number of thyroid cancer cases caused by fallout was probably at the low end of the National Cancer Institute estimate, and that thyroid cancer was rarely fatal. ‘Tell that to my brother,’ shot back U.S. Senator Tom Harkin, whose brother had died of the disease. This book is a must read for everyone. It is very interesting,informative and accurate. It contains facts about the original St. Louis study as well as the second study. How does the radiation from the atomic bomb and nuclear power effect human health? Find out. The second reviewer clearly hasn’t read the book, yet criticizes its contents. He makes many mistakes. Strange. The book is clearly written. References are plentiful. Mistake #1 is that the book is not about a “study” but a series of scientific studies measuring levels of the radioactive chemical Strontium-90 (Sr-90) in baby teeth, from atom bomb tests, the Chernobyl meltdown, and emissions from nuclear reactors. Results of all studies are published in medical journals. Mistake #2 is his assertion that Sr-90 does not cause cancer at levels observed. Sr-90 is radioactive, and thus carcinogenic, especially in children. In 1956, presidential candidate Adlai Stevenson called Sr-90 “the most dreadful poison in the world.” President John F. Kennedy cited children “with cancer in their bones” – a clear reference to Sr-90 as a reason for stopping above-ground atom bomb tests. Mistake #3 is that “the study” (probably the recent study near U.S. nuclear reactors) “has been debunked numerous times.” He ignores the fact that results were published in five medical journals, and no other study of in-body radiation near U.S. nuclear plants has been conducted. “Debunked” is a reference to unbased opinions of the nuclear industry. Mistake #4 is his accusation of “cherry picked data” – where is the cherry-picking of average Sr-90 levels and local rates of childhood cancer? Radiation causes cancer and children are most vulnerable to radiation – proved by many scientific studies. Mistake #5 is his assertion that small samples were used – the number of teeth used (5,000, mostly near six nuclear plants) is statistically significant. Mistake #6 is his non sequitur that strontium “is concentrated because it is like calcium.” It concentrates in bone and teeth, but only when atom bombs explode and nuclear reactor operate. The “reviewer” is really a biased and uninformed critic, probably not even a scientist, and an apologist for the nuclear industry. He needs to do a lot of reading to get his facts straight. I WAS EXPOSED TO NUCLEAR RADIATION IN 1952/53 WHILE ASSIGNED TO THE 56TH WEATHER RECON SQDR JAPAN FROM DUST AND AIR COLLECTIONS AS A COLLATERAL DUTY. ONE TEST WAS IN JUNE 52 (400 KT). BESIDES SEVERE SKIN CANCER, HEART PROBLEMS AND PROSTATE CANCER I HAD SO MUCH PAIN THAT I HAD MY TEETH EXTRACTED (THE ONES WITH FILLINGS). I DO HAVE A LOT OF INFORMATION THAT I WILL PASS ON IF THE STUDY IS IS ONGOING. I AM MILITARY RETIRED AND I NEED RESULTS OF THE STUDIES FOR.THE V.A. From their web site it appears that the Radiation and Public Health Project is still accepting baby teeth: http://www.radiation.org However, if you still have your pulled teeth it would be better if you get someone to examine all of the types of radionuclides in your teeth. The Baby Tooth Project seems to be just examining the strontium and you would have other things in there as well. Also, strontium 90 has a half-life of 30 years, though they can account for that, unless it’s disappeared. Two half lives would have passed. I would look most likely for Plutonium and maybe Americium. Probably there are other things there too. In fact, why don’t you start with a radiation detector testing for alpha, gamma, and beta externally on the tooth. It would be interesting to talk with the people at this project and see if all of you can help each other. I think they are NYC which shouldn’t be too far from you in Mass. Also make sure you sort out the difference between high energy internal alpha emitters and low energy gamma emitters. Almost everyone seems to be muddling this up. I’m still trying to understand what the VA wants from you? What does it mean for your problems to be “rated by the VA”? Are they refusing you service? If you are a sick veteran they should give you service regardless of the origin of your disease. It seems like the VA should be giving you information and not vice versa. Have you tried for information under the Freedom of Information Act? Have you made contact with the veterans who were injured helping out at Fukushima? That might be a good idea for you and them. Also, if the VA is refusing you service or not acting properly you may want to join in with some other veterans, as well looking for a more respectful VA Hospital. Do you have retired CIA buddies who might have some additional info? Also, trying to understand which 400 kiloton bomb you were exposed to (via cleaning the air filters) — was it Operation Ivy’s “King”, which is listed as 500 kiloton or was it the Soviet “Joe 4” at 400 kiloton? King was a plutonium bomb. I guess you could have gotten exposed to Joe 4 while flying Weather-CIA reconnaissance flights over the USSR or dealing with filters from planes that did so? The 400 kiloton was only the largest of many you were exposed to, it seems? Especially if it was Joe 4 you may want to make some contact with some Chernobyl doctors — the ones who are concerned about the radiation and not those denying exposure. There were some pilots who seeded Chernobyl fallout to make it rain, too. Elsewhere you have mentioned four special ops: Gumshoe, Top Hat, Barkeeper and Catalan. These “Installed Special Equipment on Aircraft to Detect Radioactivity. All Four Operations Made Contact with Radioactive Clouds or Masses”. This was from July 1, 1953 to December 31, 1953. It was Squadron 056, Strategic Reconnaissance, Medium, Weather. I am sad and horrified that they exposed you to this stuff. It wouldn’t have taken much to have you put on a mask, make sure you were properly dressed, and to warn you. Maybe the gamma caused the skin cancer and that light protection wouldn’t have done you much good for that, but it would have helped protect from internal doses from inhalation, skin absorption, and ingestion. Probably they could have given you lead suits to protect you from gamma, as well as face masks. You’ve been betrayed and if the US government is willing to betray someone either doing or supporting the important Weather-CIA reconnaissance missions over the USSR during the Cold War, what hope is there for everyone else? I’m not saying that your immediate supervisors knew but the dangers were known. They had done all sorts of animal and human experiments by the time of your exposure. However, I just looked at an interview of Waldo Cohn, Oak Ridge Biochemist, born ca. 1900, and he said that he didn’t have to do experiments. He said you could look at the elements and tell what they would do! This seems true. If you know how the various elements mimic things in the body – caesium mimics potassium, strontium mimics calcium, and plutonium, americium, and others mimic iron, then you have some idea already. These are actually acting as poisons by disrupting basic processes, as well as irradiating you from within. It sounds terrible and you are living proof that it IS terrible. So, internal impact could be predicted just from that vantage. For external they had a long history of x-ray experiments. Of course, some things they didn’t know about physiology, but they knew enough to know it was dangerous from the animal cancers. It seems that groups of over 10,000 soldiers were also knowingly exposed on the ground to various tests. Someone – you would think your agency (CIA) must have kept tabs on all of this. With these sorts of numbers they should have been able to do really serious statistical research on soldiers. The general problem you are facing now is that there probably aren’t many of these men still alive. Also, your operation was more unique. To start to be considered statistically significant you need at least 50 people. 2,000 would be ideal. BUT, you can still be a unique and important case study or one of a handful. It would be very easy to match up your symptoms and exposure. But, it still seems that the VA is pulling your leg. Wouldn’t they have been following your health over the last 60 years and you are actually a guinea pig? So, really they should be giving you info and not vice versa! Maybe with your experience with the CIA, Special Ops, you are better placed than average to understand why the US (and UK) insisted on treating their own soldiers as guinea pigs, when the dangers were known! No one can be surprised that the USSR did this, but it is shocking that the US and UK betrayed its soldiers in this way. Considering your high importance for Airplane Reconnaissance over the USSR, it is even more shocking. And, this is no longer the Cold War! Why are soldiers and others still being treated as guinea pigs? I am simply unable to understand. Please let us know how things progress. Also, if you want to write-up something for us to post as a free-standing post, or if you want us to do some research outlining what the connection might be between your ailments and your exposure, please let us know. This would obviously have to be general and hypothetical. We would need to know which weapons tests you were exposed to in order to think about what came into the filter. Regardless, we may speak generically of these things at a future date to educate others. I don’t want any more problems to fall upon you, so hesitate to use your name, unless you think it will help to publicize it more? Unless you have plenty of money for private doctors they’ve got you cornered haven’t they? Some of the International Physicians for the Prevention of Nuclear War might help you for free. Thanks for writing! Please let us know if and how we can help! I’m glad you were able to find a spot to post a comment. Due to silly people we cut off some of the comment sections, at least temporarily. When the atmospheric nuclear testing ended in 1963, no medical follow-up was ever conducted by the Atomic Energy Commission or Department of Defense. There was never any government-sponsored medical surveillance of its ‘atomic test subjects,’ nor any attempt on the part of the government to contact those who participated in the atomic tests and alert them to the fact their health was potentially at risk. Contact the U. S. Department of Justice and request the forms for compensation, they service the Radiation Exposure Compensation Act. If you file with the Veterans Administration you will be filing with the wrong Agency. The only thing is this seems more Nevada testing but maybe someone with either the DOJ or the Atomic Vets Association can help you. Please let us know if you have received our replies. Here is more info: http://www.publichealth.va.gov/docs/radiation/atomic-veteran-brochure.pdf If you were exposed to US weapons testing you are included. I hope they aren’t excluding you because of being exposed to Soviet testing! Probably searching under atomic veterans there is a lot more. Veterans are supposed to have benefits, period! Just reread your comment. I still do not understand why it is your responsibility to get your own teeth tested. However, it is a good idea to have a nongovernmental party to test. Still I hope you will have it tested for plutonium, and other things – not just strontium 90. I think the Radiation and Public Health people will love to help you. If not there are other groups testing baby teeth – one in South Africa and I think one Latin America. (Update to comment — apparently this is handled through the DOJ. Still would be interesting to send your teeth to an independent lab).